Did you know that 22% of those served by our food pantry are 60 and over? 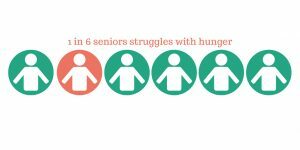 In America 1 in 6 seniors faces the threat of hunger, meaning they aren’t receiving or don’t have access to the necessary food and nutrients to sustain themselves. What Leads Seniors to be Hungry? Age – Surprisingly, seniors between the age of 60-70 are most likely to experience food insecurity. Some reasons why may include low income when job security is at risk, government supports not yet in place, or they aren’t yet old enough to be in assisted living. Race – African American seniors are more likely than white senior to experience food insecurity (50% compared to 16%) and Hispanic seniors are more likely to experience food insecurity than non-Hispanic seniors (40% compared to 17%). Education – those with a high school diploma or less are much more likely to experience food insecurity than those with a college degree. This is most likely due to earlier income opportunities. To see if you qualify for Home Delivery, call us at 919-362-0657.